Today I was looking for a freeware application to convert DVD Videos to MPEG-4 format. 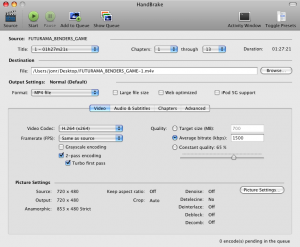 While searching I found HandBrake and was really impressed by the way it works. HandBrake is an open-source, free, GPL-licensed, multiplatform, multithreaded video transcoder to convert your videos from one format to another. HandBrake is available for Windows, Linux and MacOS X.
HandBrake is a video transcoder that can convert your movies and transfers them to a format that’s useful on your computers, mobiles, media centers and other portable electronic devices. The processing time is not really very less. I used it to convert my DVD’s to MP4 so that I can play them on my Nokia 5800 Xpress Music Mobile. There are some predefined presets for Apple iPod, Apple iPhone, AppleTV, Television, PSP, PS3, Xbox 360 and many others. You can save the output video in different formats like AVI, MP4, MKV or OGM with Video encoding in MPEG-4, H.264 or Theora and Audio encoding in AAC, MP3, Vorbis or AC-3. The other features include Chapter selection, Picture deinterlacing, scaling and cropping, Basic subtitle support and Grayscale encoding. Vorrei provare questo programma per convertire un filmato DVD in formato AVI o altro. Grazie.